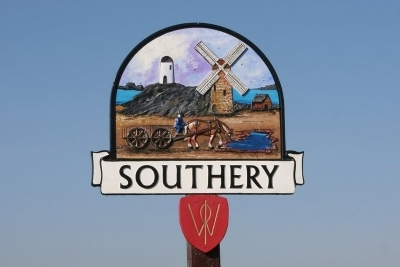 Southery, coming from the Old English ‘Southern Island’ is the other village on the ‘island’ with Hilgay and owes its foundation to its position above the flood level of the fen. It was well established by the time of Domesday Book, when the parish lands were held by the Abbot of St Edmunds. Various agricultural resources were mentioned at the time including a large number of sheep and a fishery. The earliest archaeological finds are pot boiler scatters representing settlement at the fen shore. A large number of flint implements have also been found scattered around the parish. The Bronze Age is well represented with finds of swords, axe heads and other implements. Two human remains from this period have also been identified, with one of the skeletons, dubbed ‘Nancy’, being accompanied by eight jet beads and a bronze awl. Both were uncovered about 500 metres south of Little London. Few remains of Iron Age habitation have been found but there is rather more evidence of Roman activity. The Saxons undoubtedly settled on the raised land along Westgate Street as excavations have revealed.